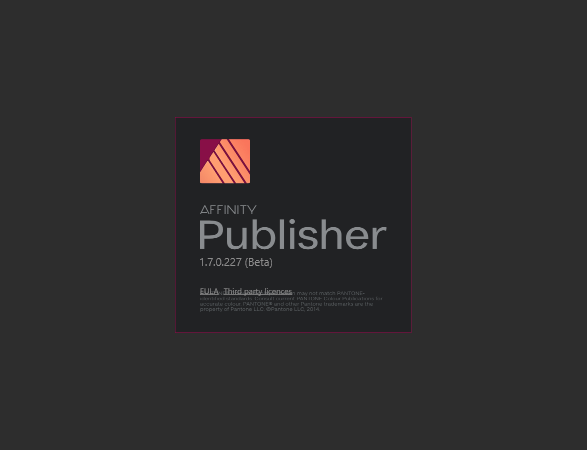 We are pleased to announce Affinity Publisher build 227 is now available as a manual download from the link above. We hope to put it on auto-update soon. Please note that due to reported issues, previous build 221 was not put on auto-update. Due to the recent changes in Master Page functionality we strongly suggest you backup any documents that are valuable to you before testing. Thanks for the new beta. Installed and runs. Clicked OK and the install completed. No reboot needed. Ok, I will use workaround trick, while I waiting. I wrap a book now, but this bullet feature will help in next books. Note that Windows SmartScreen wont let the installer run automatically. I think it would be helpful to provide checksums so people will know they have a good install file. These are the file hashes/checksums on the file I installed without any issues. I just tried to install (4 times) 227 and it keeps failing with the same message each time. Now.. also my 206 will not start either which I am trying to do some work on. It was running great until I tried to install 227. "Setup failed" is indeed a pretty bad feedback for the user. Something like "No write permission" or something that gives the user should be considered. Even an error code would help users to google their problem. This beta won't even begin to load on my Windows 10 laptop (Version 1803. Build 17134.523). The setup screen doesn't even appear. Just a blip appears on the Taskbar (that disappears in a second or so) but nothing else? Machine is an Inspiron 15 7000 gaming system; Intel I7 64-bit, 16 GB RAM, 303GB free HD space. 4K screen. 1. Right-clicked on the installer executable and selected Properties. 2. Chose the Compatibility tab and clicked on "Change high DPI settings" near the bottom. 3. In the new screen: Near the bottom, check the box for High DPI Scaling Override. "Scaling performed by: " Choose "SYSTEM (Enhanced). 4. OK your way out of the boxes. good to read that you are up and running. My display has 3840x2160px resolution. Luckily I never had problems during the setup process of APub. Perhaps it's not the 4K scaling on your machine but an additional graphics processor? I assume a gaming machine has an additional graphics processor? Thank you. I was just about to post with this same problem, but your instructions solved it for me! Exactly my problem - which is now solved Thanks! Thanks - also for the proposed solution, but I have no monitor scaling enabled. I tried it a third time yesterday and in the meantime I just deleted the program icon from the desktop, which did not find the * .exe after the update and moved the setup.exe from the previous beta version to an external HD ... suddenly it worked without problems! ok, when you download the update, it erases the older program. so download the new version, restart your computer to rid it of all the stuff from the old version and install the new update. worked perfectly. my original post I was pretty mad then thought to restart. duh. 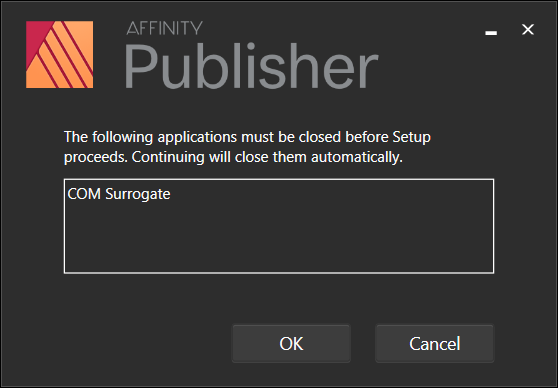 So, now to deal with the program just shutting down when trying to save as a pdf. It just quits. no error message. Just saving....then dead. Now if I could only get the work around on how to save as a pdf to work. I've heard to change your default printer to pdf. I've had to do this before in psd. lets hope this works. I'm very disappointed I can't save as an indd file to send to a printer if I have to. could be a no go for me. hate to pay adobe but can't buy this one and pay adobe esp if this one doesn't work the way I need it to. I've read you can open a pdf of an indd file. let's hope that works. this should be the fix to installing the new update. worked fine once I restarted my computer. anyone else have a program with the program just stopping period for no apparent reason. It just ends. frustrating but doing all I can to not have to commit to adobe for a year in order to get a better price. 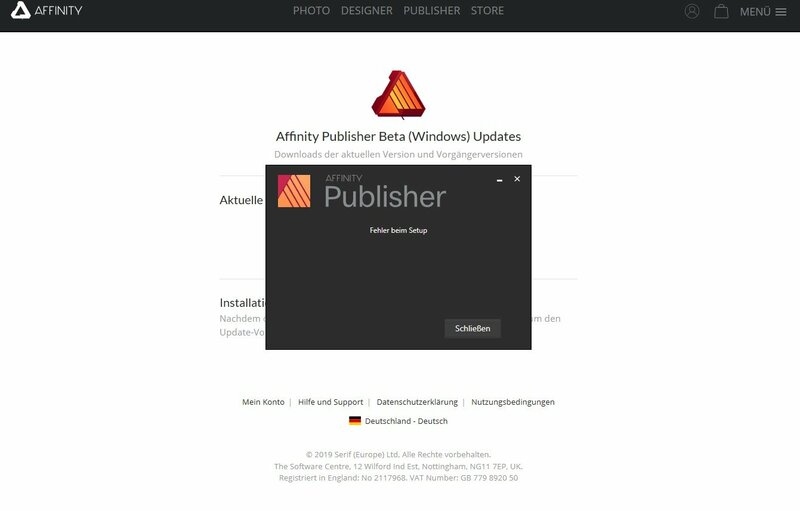 I was mad, but then I found a way to install the update, still can't save a pdf. Well as many others, i get Problems installing the new Build.. and also the last one..
Tom did you not get a UAC prompt or suitable error message? I use windows 10 and downloaded the latest - I have redownloaded and tried 4 times. 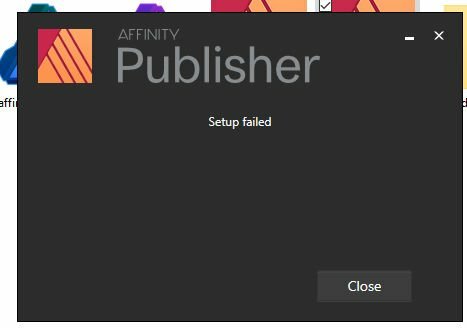 I click on it to open the .exe file and it shows the publisher icon then immediately disappears. That is all. Okay update to the above - I found the post by Harpenstreng and my issue as well was high def screen. Thank you Harpenstreng!! !